I cant help but feel chipper , every stepvof the way the just seem cuter? Bell out of order. Please knock. Just when I thought Mace couldn’t get to be any more of a fscking lunatic, and now Sil is getting him to go “back down the rabbit hole” where, hopefully once this adventure is over to some degree, he’ll wreak just ALL of the havoc. Round two goes to you too, ghosty genius boy…. I don’t know about different colour, but isn’t Frank Morgan the wizard of oz buried somewhere in NYC? Only thing that prompted me was this whole trip to the cemetery was set off when he saw wizard of oz characters near the restaurant. OMG, I think you hit the nail on the head!! 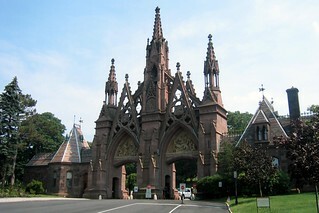 So I googled Frank Morgan’s grave and once I saw an image of Greenwood Cemetery, I knew you were right. Look at the main entrance, it’s just what Alice drew on pg 19… . That is so awesome! You are so awesome, thanks for pointing that out~☆ I really enjoy the realism in this comic. Omg yes… The ultimate teamwork. We were so right. I love predicting things. I wandered away for like a year, and just did the comic version of Facebook stalking and I’m SO HAPPY!!! I love this comic!